Characterization of EL4–IL-33 tumors. 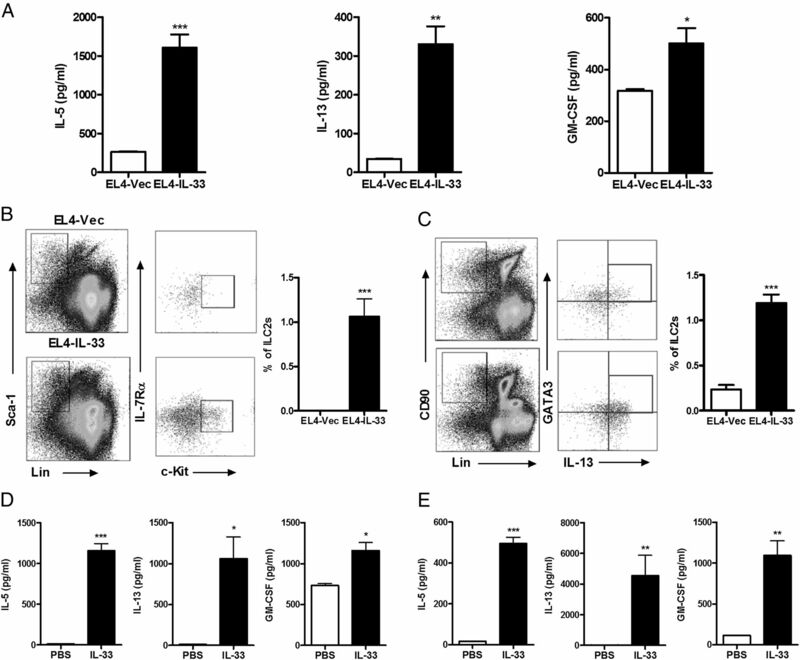 (A) Levels of IL-33 secreted from EL4-Vec and EL4–IL-33 cells. Cells (1 × 104/well) were cultured for 3 d, and concentrations of IL-33 in culture supernatants were measured by ELISA. (B) C57BL/6 mice were injected s.c. with EL4-Vec or EL4–IL-33 cells (5 × 106 cells/mouse). Tumor growth was measured two to three times weekly (n = 5/group). (C) Tumor histological sections. Samples were harvested 15 d after inoculation, and sections were stained with Mason’s trichrome. Original magnification ×100 for the upper panels and ×400 for the lower panels. (D and E) Tumors were removed 28 d after inoculation, and tumor eosinophils were analyzed by FACS. Representative FACS plots (D) and percentages of eosinophils (E) are presented (n = 5/group). (F) Quantities of hydroxyproline are presented as micrograms per 130 mg 15-d tumor (n = 5/group). (G) Real-time PCR analysis of gene expression in tumors harvested 15 d after inoculation (n = 4–12/group). Studies were repeated at least twice. **p < 0.01, ***p < 0.001 between the two groups. ILC2s are required for IL-33–inhibited tumor growth. (A) Levels of IL-5, IL-13, and GM-CSF in tumors harvested 15 d after inoculation. (B and C) ILC2s were analyzed from 15-d tumors. Representative FACS plots for Lin−IL-7Rα+c-Kit+Sca-1+ and Lin−CD90+IL-13+GATA3+ cells, and their respective percentages are presented (n = 6/group). (D and E) ILC2s were sorted from EL4–IL-33 tumors (D) and BM (E), and 1 × 104 cells/well were cultured in StemPro-34 medium containing Flt3L (20 ng/ml), SCF (20 ng/ml), and IL-7 (10 ng/ml) in the presence or absence of IL-33 (20 ng/ml) for 5–7 d. Levels of IL-5, IL-13, and GM-CSF were measured in culture supernatants. Studies were repeated at least twice. *p < 0.05, **p < 0.01, ***p < 0.001 between the two groups. 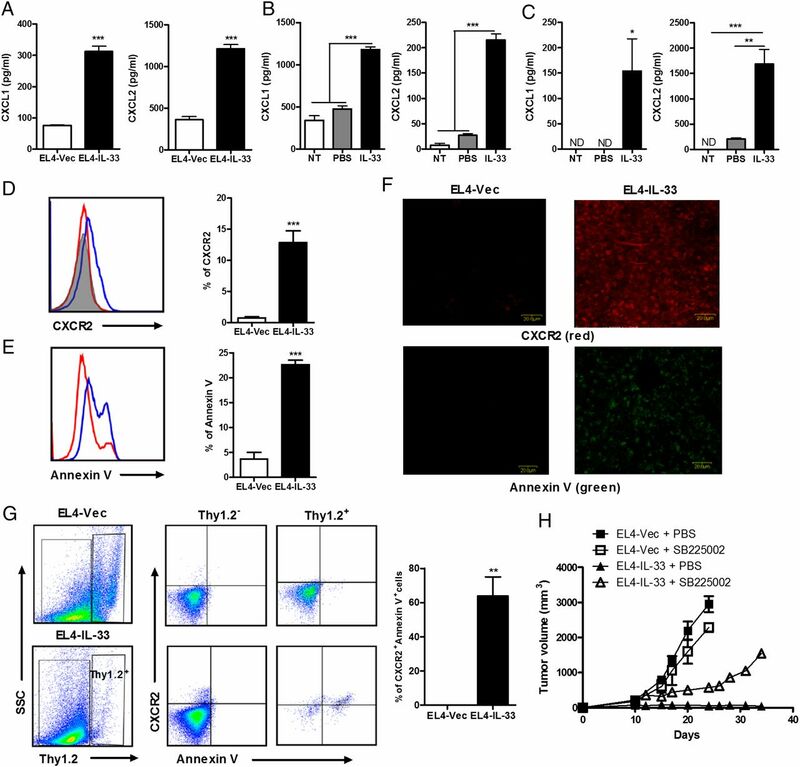 ILC2 MyD88 is required for IL-33–mediated inhibition of tumor growth. (A–D) ILC2s (1 × 105 cells/mouse) sorted from WT BM cells were adoptively transferred to Rag2−/−γc−/− mice and inoculated immediately with EL4–IL-33 cells. (A) Tumor growth curves (n = 6/group). (B and C) The percentages of ILC2s and eosinophils were determined in 27-d tumors (n = 6/group). (D) Quantities of hydroxyproline are presented as micrograms per 130 mg 15-d tumor (n = 5/ group). (E–H) MyD88−/− mice received WT ILC2s (1 × 105 cells/mouse) immediately after inoculation with EL4–IL-33 cells. (E) Tumor growth curves (n = 5/group). (F and G) The percentages of ILC2s and eosinophils in 27-d tumors (n = 5/group). (H) Hydroxyproline quantities are presented as micrograms per 300 mg 15-d tumor (n = 5/group). Studies were repeated at least twice. *p < 0.05, **p < 0.01, ***p < 0.001 between the two groups. CT26–IL-33 and B16F10–IL-33 cells do not form visible tumors. (A) Levels of IL-33 secreted from CT26-Vec and CT26–IL-33 cells. Cells (1 × 104/well) were cultured for 3 d and IL-33 concentrations were measured in culture supernatants. (B) BALB/c mice were injected s.c. with CT26-Vec or CT26–IL-33 cells (3 × 106 cells/mouse). Tumor growth curves are shown (n = 5/group). (C and D) Percentages of ILC2s and eosinophils in 23-d tumors (n = 5/group). (E) Histological analysis of 15-d tumor sections. Mason’s trichrome stain. Original magnification ×100 for the upper panels and ×400 for the lower panels. (F) Hydroxyproline quantities are presented as micrograms per 100 mg 15-d tumor (n = 5/group). 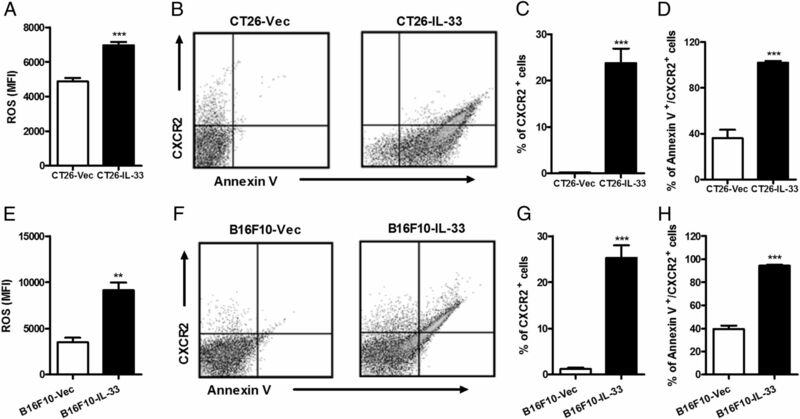 (G) Levels of IL-33 secreted from B16F10-Vec and B16F10–IL-33 cells. Cells (1 × 104/well) were cultured for 3 d and IL-33 concentrations were measured in culture supernatants. (H) C57BL/6 mice were injected s.c. with B16F10-Vec or B16F10–IL-33 cells (2.5 × 106 cells/mouse). Tumor growth curves are shown (n = 5/group). (I and J) Percentages of ILC2s and eosinophils in 29-d tumors (n = 5/group). (K) Histological analysis of 15-d tumor sections. Mason’s trichrome stain. Original magnification ×100 for the upper panels and ×400 for the lower panels. (L) Hydroxyproline quantities are presented as micrograms per 100 mg 15-d tumor (n = 5/group). Studies were repeated at least twice. *p < 0.05, *p < 0.05, ***p < 0.001 between the two groups. 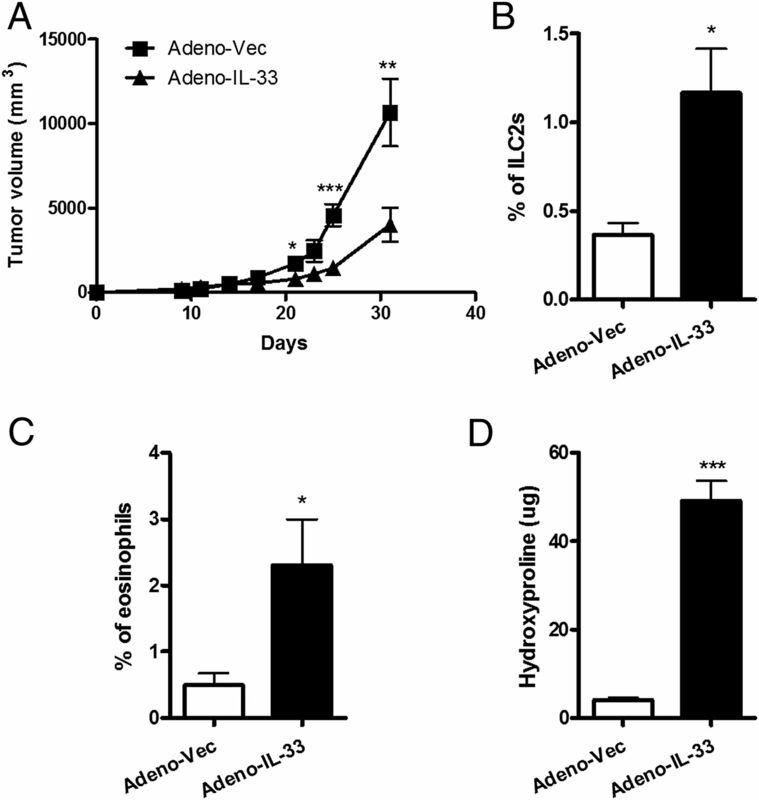 Regression of tumor growth by intratumoral injection of Adeno–IL-33. 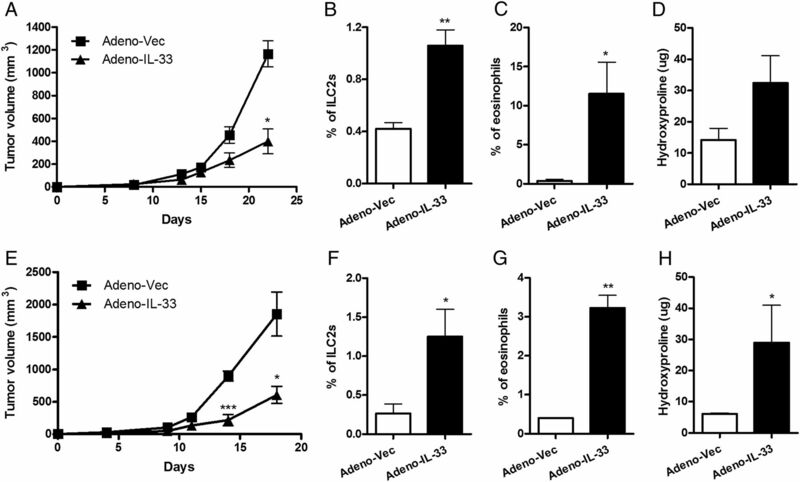 Tumor-bearing mice received intratumoral injections of Adeno-Vec or Adeno–IL-33 (2 × 107 CFU/mouse) at 2-d intervals 10 d after inoculation with EL4 cells. (A) Tumor growth curves (n = 6/group). (B and C) Percentages of ILC2s and eosinophils in 31-d tumors (n = 6/group). (D) Quantities of hydroxyproline are presented as micrograms per 100 mg 15-d tumor (n = 5/group). Studies were repeated at least twice. *p < 0.05, **p < 0.01, ***p < 0.001 between the two groups. Regression of CT26 and B16F10 tumor growth following intratumoral injection of Adeno–IL-33. Tumor-bearing mice received intratumoral injections of Adeno-Vec or Adeno–IL-33 (2 × 107 CFU/mouse) at 2-d intervals beginning 10 d after inoculation with CT26 cells (A–D) or B16F10 cells (F–H). (A and E) Tumor growth curves (n = 5/group). (B, C, G, and H) Percentages of ILC2s and eosinophils in 22-d CT26 tumors or 18-d B16F10 tumors (n = 6/group). (D and H) Hydroxyproline quantities are presented as micrograms per 100 mg 15-d tumor (n = 5/group). Studies were repeated at least twice. *p < 0.05, **p < 0.01 between the two groups. 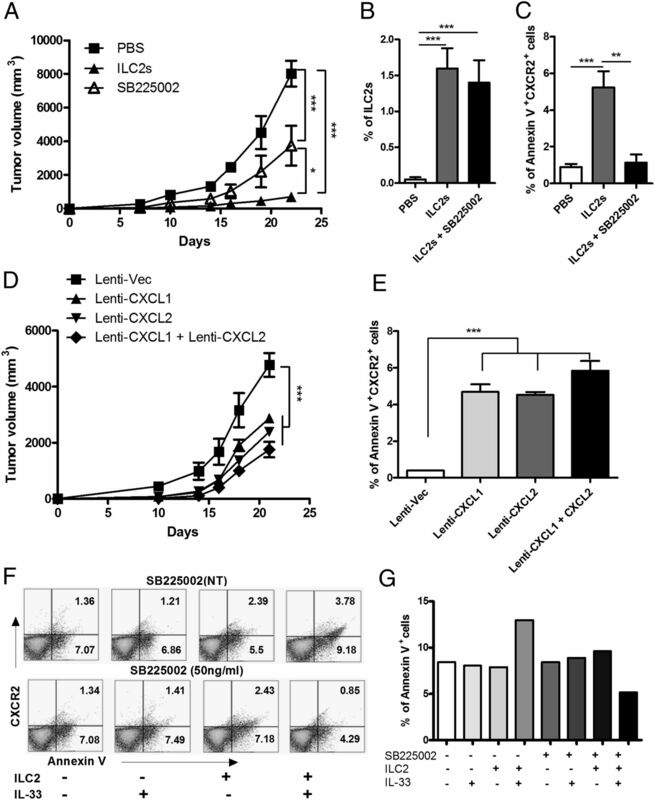 CXCR2 signaling is responsible for IL-33–mediated inhibition of tumor growth. (A) Levels of CXCL1 and CXCL2 in 15-d tumors. (B and C) ILC2s were sorted from EL4–IL-33 tumors (B) and BM (C), and 1 × 104 cells/well were cultured in StemPro-34 medium containing Flt3L (20 ng/ml), SCF (20 ng/ml), and IL-7 (10 ng/ml) in the presence or absence of IL-33 (20 ng/ml) for 5–7 d. Levels of CXCL1 and CXCL2 were measured in culture supernatants. (D–F) Tumors were harvested 15 d after inoculation (n = 5/group). (D) A representative CXCR2-stained FACS histogram and the percentages of CXCR2-expressing cells are presented. Blue line indicates EL4–IL-33; gray line indicates isotype control; red line indicates EL4-Vec. (E) A representative annexin V–stained FACS histogram and percentages of annexin V+ cells. (F) Immunohistochemical staining for CXCR2 (red) and annexin V (green) in 10-d tumor sections. Original magnification ×80. (G) Thy1.1+ congenic mice were inoculated with Thy1.2+ EL4-Vec or EL4–IL-33, and tumors were harvested 10 d after inoculation. Thy1.2+ tumor cells were gated and dot plots for CXCR2+/annexin V+–stained tumor cells and their percentages are presented (n = 5/group). (H) Tumor-bearing mice received PBS or SB225002 (20 μg/mouse) at 2-d intervals beginning 10 d after inoculation. Tumor growth curves are shown (n = 6/group). Studies were repeated at least twice. *p < 0.05, **p < 0.01, ***p < 0.001 between the two groups. 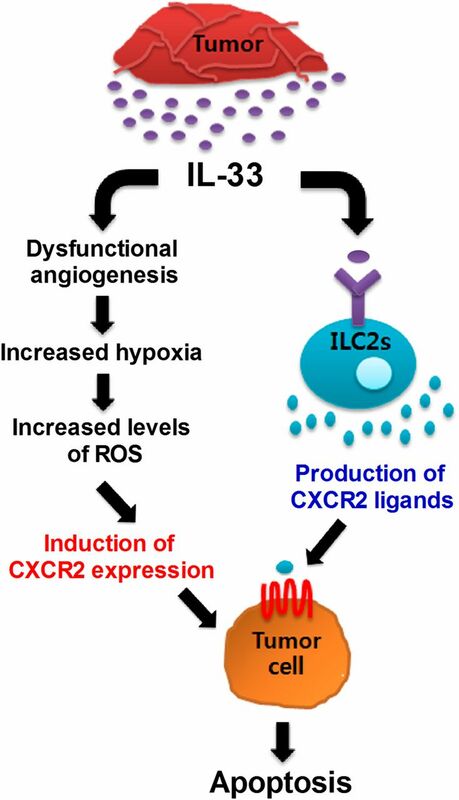 Association between dysfunctional angiogenesis and CXCR2 expression in EL4–IL-33 tumors. (A) Gross observations of tumor vasculature 14 d after inoculation. (B and C) Permeability assay for tumor vessels. Evans blue permeability was observed in 15-d tumors 30 min after i.v. injection of Evans blue (B), and Evans blue was extracted from the tumors (C). Data are presented as nanograms per 100 mg tumor (n = 5/group). (D and E) Real-time PCR analysis for the expression of angiogenesis-related genes in 12-d tumors. (F–H) Immunohistochemical analysis for vasculature in 10-d tumors. Frozen tumor sections were double stained for CD31 (red) and α-SMA (green) (F). CD31+ and α-SMA+ vessel areas were calculated on randomly selected fields. Images were generated at ×400 original magnification. (G) Percentages of CD31+ vessel areas (n = 9). (H) Ratios of α-SMA+ to CD31+ vessel area (n = 12). (I) Evaluation of tumor hypoxia. Pimonidazole hydrochloride was injected into mice 10 d after inoculation and tumors were harvested 1 h later. Data are presented as percentages of the area of pimonidazole pixels in tumor sections (n = 5/group). (J) ROS levels in cells isolated from 10-d tumors. Data are presented as a mean fluorescence intensity (MFI) (n = 5/group). (K and L) EL4 cells were cultured in the presence of PBS or H2O2 for 24 h and CXCR2 expression was analyzed. (K) Representative CXCR2-stained FACS histogram. Blue line indicates H2O2; gray line indicates isotype control; red line indicates PBS. Studies were repeated at least twice. *p < 0.05, **p < 0.01, ***p < 0.001 between the two groups. Association between ROS, CXCR2 expression, and apoptosis in CT26 and B16B10 tumor cells. CT26 (A–D) and B16F10 tumors (E–H) were harvested 10 d after inoculation and analyzed. (A and E) ROS levels in cells isolated from 10-d tumors. Data are presented as mean fluorescence intensity (MFI) (n = 5/group). (B and F) Representative CXCR2- and annexin V–stained FACS plots. (C, D, G, and H) Percentages of CXCR2+ cells (C and G) and CXCR2+annexin V+ cells (D and H) are shown. Studies were repeated at least twice. **p < 0.01, ***p < 0.001 between the two groups. CXCR2 ligands secreted by ILC2s are sufficient to regress EL4–IL-33 tumor growth. (A–C) ILC2s (1 × 105 cells/mouse) sorted from BM cells were adoptively transferred to Rag2−/−γc−/− mice and inoculated immediately with EL4–IL-33 cells. Tumor-bearing mice received PBS or SB225002 (20 μg/mouse) at 2-d intervals beginning 10 d after inoculation. (A) Tumor growth curves (n = 5/group). (B and C) Tumors were harvested 22 d after inoculation and the percentages of ILC2s (B) and annexin V+ CXCR2+ cells (C) were analyzed (n = 5/group). (D and E) Tumor-bearing mice received intratumoral injections of Lenti-Vec, Lenti-CXCL1, Lenti-CXCL2, or a combination of Lenti-CXCL1 and Lenti-CXCL2 (5–50 × 105 CFU/mouse) at 2-d intervals beginning 10 d after inoculation. (D) Tumor growth curves (n = 5/group). (E) Percentages of annexin V+CXCR2+ cells in 21-d tumors (n = 4/group). (F and G) ILC2s (1 × 104 cells/well) were sorted from BM and cocultured with EL4 cells (1 × 105 cells/well) in DMEM containing Flt3L (20 ng/ml), SCF (20 ng/ml), and IL-7 (10 ng/ml) in the presence or absence of IL-33 (20 ng/ml) and SB225002 (50 ng/ml). After 24 h, EL4 cells were stained for CXCR2 and annexin V. (F) FACS plots. (G) Percentages of annexin V+ cells. Studies were repeated at least twice. *p < 0.05, **p < 0.01, ***p < 0.001 between the indicated groups. 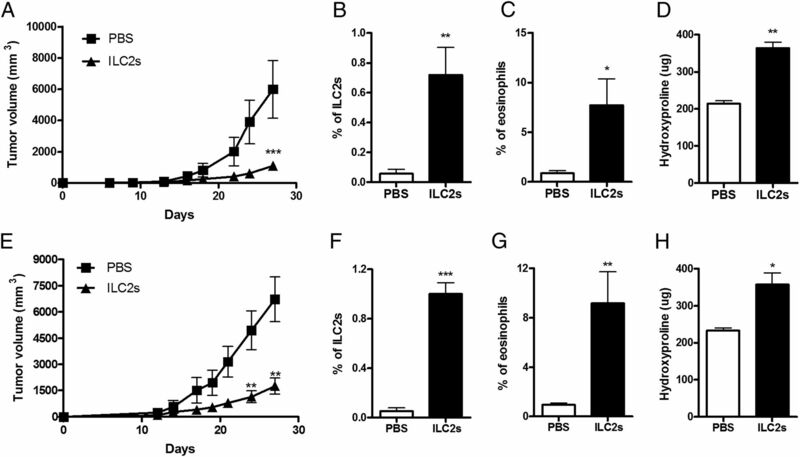 Immune cells are not involved in IL-33–mediated inhibition of tumor growth, and local production of IL-33 does not affect systemic antitumor immunity. 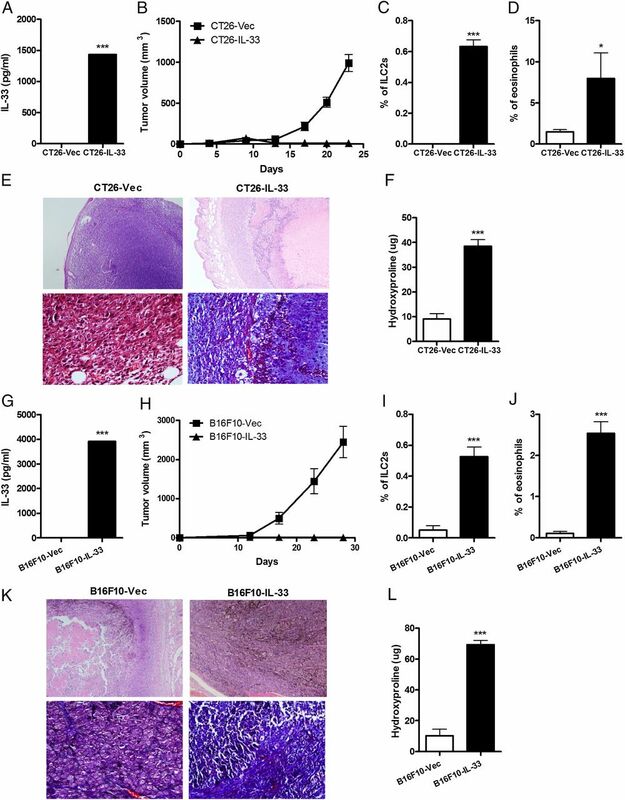 (A and B) Tumor-bearing mice received intratumoral injections of PBS or clodrolip (50 μg/mouse) and control Ig or anti–Gr-1 mAbs (5 μg/mouse) at 2-d intervals beginning 10 d after inoculation with EL4 or EL4–IL-33 cells to deplete macrophages. Tumor growth curves are shown (n = 5–6/group). (C and D) C57BL/6 mice were inoculated with B16F10-Vec or B16F10–IL-33 cells, and control Ig, anti-CD4, or anti-CD8 mAb (200 μg/mouse) was injected every 5 d starting from the day of inoculation. Tumor growth curves are shown (n = 5/group). (E) C57BL/c mice received control Ig or anti-asialo GM1 (50 μg/mouse) on days −2, 0, 3, 10, and 17. Mice were inoculated with B16B10-Vec or B16F10–IL-33 cells on day 0. Tumor growth curves are shown (n = 5/group). 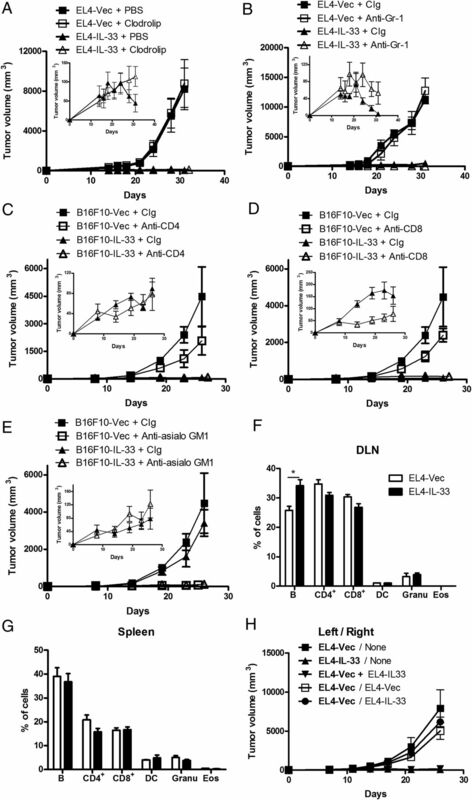 (F and G) Changes in immune cell compositions in the draining lymph node (DLN) and spleen were analyzed 7 d after inoculation with EL4 or EL4–IL-33 cells (n = 8–10/group). (H) One group of mice was inoculated in the left flank with EL4-Vec, EL4–IL-33, or a mixture of an equal number of EL4 and EL4–IL-33 cells. The other group was inoculated with EL4 cells on both flanks or with EL4 cells in the left flank and EL4–IL-33 cells in the right flank. Tumor growth curves are shown (n = 5/group). Studies were repeated at least twice. *p < 0.05 between the two groups. A schematic diagram for the mechanism underlying the inhibited tumor growth initiated by IL-33. 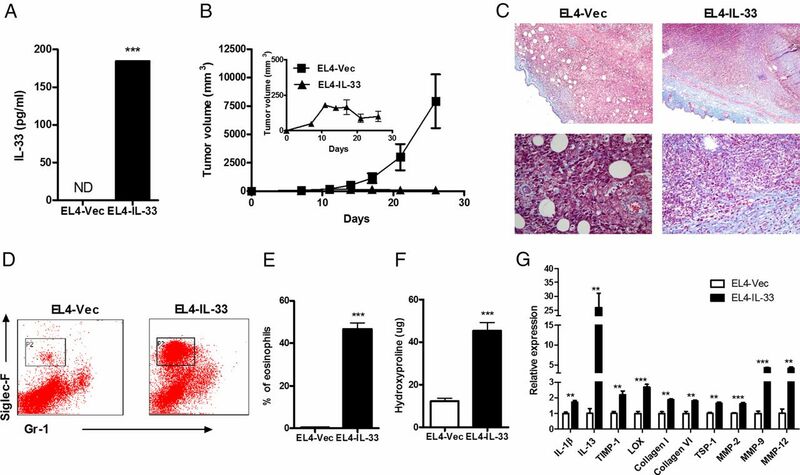 Local production of IL-33 results in dysfunctional angiogenesis, which renders the tumor microenvironment severely hypoxic. Thus, ROS levels increase, inducing expression of CXCR2 on tumor cells. IL-33 elicits massive expansion of ILC2s and production of CXCR2 ligands from these cells. The two signaling events converge to reinforce tumor cell–specific apoptosis via CXCR2.